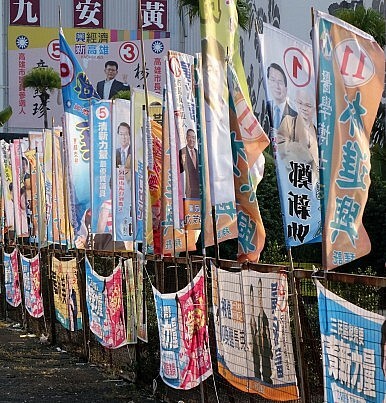 Flags promote candidates in Taiwan's 2014 local elections. Taiwan’s transition to a democracy has lessons for mainland China. Editor’s note: This is a translated version of a speech given at the Shangrao Concentration Camp in Jiangxi Province. This is the former site of “Shangrao Concentration Camp,” where the Chinese National Party (KMT) imprisoned over 700 people – soldiers from the New Fourth Army and patriots pursuing democratic progress. In the 1940s, in order to protect its one-party autocracy and suppress dissidents, the KMT arrested, imprisoned, killed and tortured people at will, without legal process or judgment. Today we come here for patriotic education, which has real practical significance. Recently, the KMT nominated Hung Hsiu-chu to run for president in 2016. From a concentration camp to participating in a humble democratic election – it’s quite a large leap for the KMT. Many friends have asked me for my views on this. As of yet, I’ve only rarely written on Taiwan. Now I’d like to say something. In their fight to overthrow the dictatorial Qing Dynasty, the KMT fought fiercely, winning power at the cost of martyrs’ lives. After they came into power, although they promised China a constitutional democracy, they used every excuse to delay things and hold on to their one-party autocracy. One excuse was the people’s “quality” (the argument that China needed to be unified by a military regime, then undergo a period of political education before finally moving to a constitutional government). Other excuses were the international situation (the Japanese invasion and surrounding foreign armies), and the need for long-term stability maintenance (stabilizing the country and suppressing communist “bandits” in order to resist foreign aggression). At that time, besides the Chinese Communist Party-led democratic campaigns against corruption and authoritarianism, all sectors of the society, especially intellectuals, fought in many different ways against “the reactionary KMT.” In the end, the KMT, which insisted on one-party autocracy, was expelled to Taiwan by the CCP, which promised to build China into a democratic and free society governed by law. After retreating to Taiwan, the KMT still used every excuse to reject democracy and enact martial law. But the tide of history can’t be turned. On the island, every type of democratic force — grassroots protests, attorneys defending rights, and intellectuals spreading ideas –rose in waves, one after the other. Outside the island, waves of democracy also affected the political situation in Taiwan. For over 30 years, Taiwan endured a long fight between the darkness and the light, during which intellectuals were suppressed and arrested, attorneys were falsely charged and imprisoned for baseless accusations, and dissidents were badly tortured and even assassinated. Yet the KMT, with Chiang Ching-kuo as its leader, finally realized that their insistence on one-party autocracy was doomed. Only by returning rights to the public could the KMT find a way to survive. Before his death, Chiang loosened his grip on power. By the end of Lee-Teng-hui era, Taiwan’s democratic forces had claimed the final victory. After the 2000 elections, when the KMT lost power, mainland Chinese media lamented the change, and even sighed over the end of the “century-old” KMT. However, the KMT, by accepting good advice and implementing a constitutional democracy in the end, fulfilled the solemn promise it made to China and the world when it came to power over 70 years ago. Although the KMT lost its political power in the 2000 elections, it gained legitimacy. According to democratic politics, a political party with legitimacy, even one that once functioned as an evil dictatorship, can adjust its own policies, listen to the public, gather strength again, and return to power — by making heads nod instead of making heads roll. Today, we can’t forget the KMT’s history as a dictatorship because of its current legitimacy, but nor should we use its dark history to deny that the KMT later followed historical trends and made unprecedented achievements in the political arena. More importantly, we should think about how the KMT in Taiwan was able to gradually get rid of a vicious political cycle and develop from yesterday’s Shangrao Concentration Camp into today’s democratic elections. We should also think about how today’s mainland China can escape the reform bottleneck and move toward a bright future. Taiwan’s democracy is still young, and has many problems, but with the next few elections and transfers of power, both the governing and the governed will master the core of democracy. Of course there are problems in Taiwan’s democracy, but problems unsolved by the democracy can’t be fixed merely by suppressing dissident, maintaining stability and arresting attorneys. The reason why I’ve mainly stopped commenting on politics in Taiwan is that, fundamentally, I am not worried that it will take the wrong political path. I believe in Taiwan’s 23 million people; I believe that they have already learned how to use their votes to participate in and manage Taiwan’s politics, to control their own fate and create Taiwan’s future. We came to Shangrao Concentration Camp to cherish the memory of revolutionary martyrs, review history, and look forward to the future. We review history to avoid repeating it and to learn lessons. We look forward to the future in order to create a better future together. We will follow the core socialist values put forward by the 18th National People’s Congress by carefully implementing “democracy, freedom, rule of law, equality, and justice.” And we firmly believe that, as long as all of our patriots work together, things like the Shangrao Concentration Camp will never occur again, either in Taiwan or in mainland China. The future is bright and beautiful. Chiang Ching-kuo was a rare dictator who willingly initiated a peaceful transition to democracy.